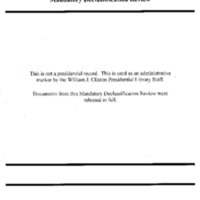 This Mandatory Declassification Review contains material on Principals Committee (PC) and Deputies Committee (DC) meetings on Somalia in 1993. Materials include a list of countries to approach for additional troops and a chart on forces currently in Somalia. This Mandatory Declassification Review contains material on Principals Committee (PC) and Deputies Committee (DC) meetings on Somalia in 1993. 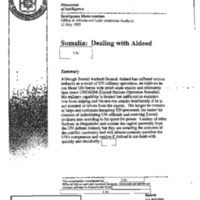 Materials include a July 12, 1993 report concerning Somali warlord General Aideed and a December 7, 1993 report on the Somali ports of Chisimayu and Boosaaso.